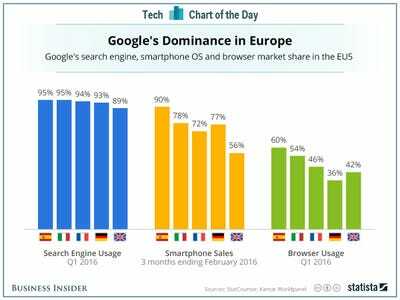 Google is currently the subject of two investigations by the EU into whether its search and Android products are illegal monopolies that should be broken up. Today, at the Cannes Lions ad festival in Southern France, Alphabet chairman Eric Schmidt answered questions on stage about the “anxiety” Europe feels about Google’s dominance on the continent. Google has a 90% share of the search market and a 90% share of the smartphone operating system market in many European countries. The EU inquiry “so far has not had an impact on consumers, and not much of an impact on our brand, so we’ll see,” he said. “Our strategy, and my personal strategy, is to get to know the regulators very, very well.” Schmidt does that because “people don’t know how we work,” he says. Business Insider got a glimpse of Schmidt’s one-on-one lobbying strategy at Davos in 2015, when we eavesdropped on him as he chatted up the president of Estonia, Toomas Hendrik Ilves, who used to be a member of the European Parliament and now sits on the Council on CyberSecurity’s Advisory Board. Much of the EU inquiry has been conducted behind the scenes. It got started because of intense but quiet lobbying by companies like Yelp. In 2014, the former EC president José Manuel Barroso had dinner with Yelp CEO Jeremy Stoppelman who complained to him about Google’s tactics in downplaying non-Google search results. Google was, perhaps, a bit slow to respond, and now the European Commission has two full-blown investigations into whether Google should be broken up. No one expects that to happen. But it could happen, in theory. 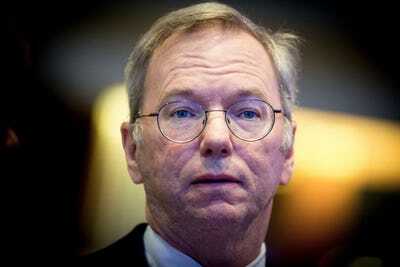 It looks like Google is now responding in-kind, with Schmidt taking the kind of face-to-face meetings with European officials that triggered the probes in the first place.